While we are no longer making active post of Cricut projects on this blog as of 8/1/2013, we invite you to use it for continued die cut inspiration as we will leave the blog up for viewing. Happy Cricuting ! Well Cricut FANatics, today is the last posting day on the blog. Sniff, Sniff. I know how you must be feeling as my heart is heavy today too. It has been my privilege to host this blog for you and I want to thank everyone for visiting us here to get your Cricut inspiration. I also ask you to join me in sending a big thank you out to my other two administrators Rebecca and Amy for assisting me with hosting challenges and blog admin advice. You ladies were a joy to work beside. And a really really really BIG THANK YOU to all the Cricut FANatics Design Team members, past and present who have so inspired us with their Cricut creations. The variety of projects we have had posted is truly astounding and goes to show how the Cricut products really push our creativity in new directions. I encourage you to follow the individual designers on their blogs to keep the inspiration coming to you. As mentioned before, I will NOT be deleting the Cricut FANatics blog. Please continue to use the blog as a reference. The database of project posts is searchable and you can use the labels list to quickly find projects for inspiration. The blog will stay up as long as Blogger allows it to do so. 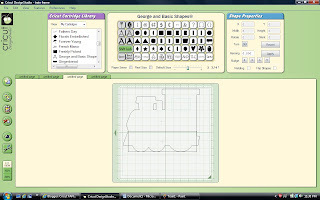 As far as myself, I will still be crafting and continue to post all kinds of die cut projects including Cricut on my website at www.scrapmequickdesigns.com and welcome you to follow me there for inspiration. When you stop by, please leave a comment to say hello ! I also have a die cut focused Facebook Group "Crafty Cut Ups" and I invite all of you to join us there for more crafting fun too ! I wanted to leave you all with one last Cricut Project Tutorial to inspire you. One of my all time favorite cartridges is the Close to My Heart "Artiste" cartridge. There are so many amazing things you can do with this cartridge. I LOVE all the fun mini albums and decided to make one for my final Cricut FANatics project. It was hard picking but I finally decided to use the mini album on page 59 in the image book/page 37 in assembly instructions. It is recommended you make your mini album no less than 3.8" tall/wide. I decided to make it an even 4" to fit my photos a bit better. 2. Take a few minutes to decide what order you want to use the patterned paper. Don't forget there is a front and backside so be sure and check to make sure the patterns look nice on both sides together. 3. It's important to give some thought to which paper you are going to use of the front and back cover of the mini album. Give a little thought to the way you may want to decorate the front cover to give you some idea of what might look best with what you have in mind. Here I selected the dark blue pattern to be the front and back cover for my book. The bird paper is the B side of the same paper so that becomes the inside of the front and back cover. (and yes, I realized After I cut the paper that I should have made sure to turn the paper on my mat so the inside design was horizontal but it still looks fine to me ). 4. Cut the inside pages according to the diagram in the Cricut manual. I cut all the pages at 4", same size I cut the cover. As you can see, the pages automatically cut out at the right size without adjusting each page manually to get the graduated sizes of the mini album pages. Cool, right? 5. Layer the inside pages in the recommended order according to the assembly directions on page 37 within the back and front covers. Add book binding rings to hold it together. 6. Now for the fun part...DECORATING THE MINI ALBUM ! One of the great things about using a collection pack is that they generally come with embellishments of some kind that make decorating your mini album super easy ! For this mini book I used the stickers and die cut pieces that were in the collection and a few little embellishment gems from my stash. And my trusty Tim Holtz Tiny Attacher, ATG and some foam pop dots. Here I layered some stickers on the binding edge and across the bottom of the cover. Next I decided to use the circle flower cardstock piece on the rounded flap of the album cover as part of the closure feature. To do that, I adhered it to the rounded flap so that it hangs off the edge as shown towards the center of the front cover. Next, I added the label sticker in the center of the front cover, then layered on top with a foam pop dot the Every Day Moments cardstock piece, placing it so that the Circle Flower piece would tuck under it just slightly to hold the mini album cover together when closed. To finish the cover off I added a rose shaped pearl cachabon to the flower center, a bit of yellow/white twine a the bottom edge and tied some crinkled seam binding ribbon to the top binder ring. 8. Decorate the inside pages using the selected embellishments of your choice. Think about photos you may want to use, add some places for journaling spots along the way and embellish to your hearts content to get the look you want in your mini album. Here are some pictures of the inside of my album to show off ideas of how to decorate the inside of this particular Cricut mini album. I added the tabs to top of some pages with my tiny attacher stapler, layered stickers and journal spots on others for variety. I like to add in journaling cards mixed in with some of the pages to add more interest to the overall book. I have photos picked out to put in here to make myself a little reminder book to stop and enjoy the Every Day Moments of my own life. Unfortunately I didn't have time to add them to the mini album before doing this post. But rest assured, this one will be used. I hope this tutorial inspires you to create your own mini album using some of the amazing shapes found on the Cricut cartridges. Well, I think I have dragged my feet long enough about ending this last post. Time to say Farewell Cricut FANatics and thank you for the fond memories we have made here at Cricut FANatics Blog ! Since I’m a new Grandmother, I felt it was important to document my Grandson’s ancestry on both sides of his family. I had researched my family history many years ago but now I needed to find out more about my Daughter-in-law’s family. So after she gave me the names of my Grandson’s great-grand parents I created this layout for him. I am going to frame it for his bedroom wall. I used the same cartridge, Heritage, and the same paper from DCWV. The one thing that I did change was the tree image but it still came from the Heritage cart. I typed up all of the family names in Word and placed them in the frames under the cameos and they contain my Grandson’s parent’s, all four Grandparent’s and all eight great-grand parent’s names. I know that he’ll really appreciate this when he’s older! 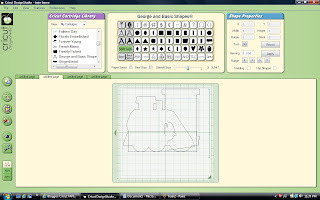 I hope that you will still follow me at my blog Angie’s Paper Passion where I will continue to post all of my crafting & Cricut projects and where I hope to continue to inspire others in their crafting pursuits! Thanks again to all of you for visiting and to Debbie for bringing us all together! The base of the card is 4 1/4 x 5 1/2 folded. Butterfly image cut at 2.5" and then glittered. There are dimensions between the green background and the navy blue background. Pearls on the butterflies and the half fans at top of card. Pattern paper cut using Imagine and All Wrapped Up. Butterfly bookmark cut at 5.5" and laminated. Butterfly on gift bag cut from Home Accents at 6". The Hersey Kiss butterflies cut from Stampin' Up double-sided pattern paper. No glueing needed for assembley. Directions can be found at Qbees Quest. Really easy to make. All Wrapped Up. Green cardstock and pattern paper. Hi fellow FANatics! This is Erika from http://ekittyscraps.blogspot.com/. I have another cricut project to show you today and here it is! I used a 5 x 7" ivory card that I already had. To cut the oval out of the gold cardstock, I used the Easter 2010 cartridge. I cut out the regular easter egg at 5 inches. The trick to this cut was to set the blade on your mat at 3/4 inches over and 3/4 inches down. This is so you have enough cardstock to make the frame. (I did see this trick on another site but I am not sure who it was-they made an Easter card with a cross and lillies on it). I left two inches on each side of the egg and cut down my 12 x 12" paper to match my card. Sorry I didn't use measurements. I have about an inch on each side of the egg. I embossed my gold mat with a 5 x 7 folder from Darice called Argyle Diamonds. I used Divine Wedding to cut the Bride and Groom image on page 38. I used orange for the background color, the tie and on the bouquet since this is the main wedding color. I embossed the skirt using the Cuttlebug D'vine Swirls folder and added some bling. I pop dotted the skirt onto the bride image. The flower trim was sprayed with Heirloom Gold-several coats and dryed with a heat dryer. I sprayed one coat of pumpkin spice/perfect pearls gold spray/water mix on my craft mat and pushed the trim through it and dryed again. There are You Tube vidoes on how to make distress inker sprays if you are interested. I glued gold rings and silver bling on my card. I added my wedding rubon to some vellum and distress inked the edges of the vellum, frame and bride and groom image. I also pop dotted the Bride and Groom image. I hope you like my card and Thanks for stopping by. Happy Saturday Cricut Fanatics! This is Rita from Rita's Paper Obsession. Today I wanted to share a picture frame I created for a picture of my husband and our nephew. We went to the train museum and I wanted to create a keepsake for our nephew. I selected the train from the Carousel cart and used Design Studio to layout the frame. The train image is 8 inches. The window was too small for my picture so I used the hide contour and placed a 3 inch square from George & Basic Shapes in its place. I cut this out three times on blue, green and red pattern paper and twice from chipboard. Next using the shadow function, I welded a rectangle to the bottom of the image to give me a flat surface. I cut this out of black pattern paper and chipboard. For the frame back, I used the welded shadow/rectangle and used the vertical frame back from the Fancy Frames cart. Again using the hide contour function I hide the rectangle utilizing only the stand portion of the image. I cut this from chipboard. To assemble, I glued the red train to a chipboard cut and the blue train to the other chipboard cut. I hand cut the smoke stack and light off the blue train. From the green train I hand cut the top of the smoke stack, the roof of the train and the cow catcher. I cut circles from George & Basic Shapes to match the size of the wheels and I created a window frame by cutting a 2 3/4 square inside a 3 1/2 square. All pieces were inked with Versa Magic "Jumbo Java"
Finally assembly of the frame, layer the train on to the shadow leaving an opening to insert the picture. Adhere to the frame back. The frame looked a little plain so I doodled some and added a number cut from the Lovely Floral cart. The numbers represent the date we went to the museum. Thank you for stopping by and allowing me to share with you this weekend. It has been a pleasure being a part of the Cricut FANatics blog. Happy Cricuting! Hi all it's Terri from www.scrappinwiththebug.blogspot.com. So a fellow scrapbooking friend of mine ask me last year to make the decorations again this year for the Miss Downriver pageant. This is actually part of the whole Miss America Organization. She told me it was a western theme and the colors were pink, brown. I told her about the fun paper from Carta Bella Giddy Up girl. It was perfect!! She wanted a banner and also some table decorations. So I made several items for the little princess party which is hosted the day before the actual crowning of Miss Downriver and Miss Downriver outstanding teen. The current Miss Michigan normally is in attendance and the girls have a BLAST. They truly are all little princess and just a delight to be around. The banner is cut from Birthday Bash using the triangle and shadow banner. I will say I'm sad to see this blog go and want to thank Debbie, and all the other designers and admins who made a great attempt to keep this going. May all you enjoy your next ventures in the crafting industry!!! Hope you all have a great day and have enjoyed the blog. 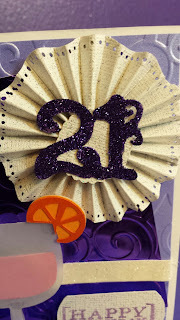 Hi Everyone, It's Melody from MelodyLaneDesigns.com I made another 21st Birthday Card. I used Pack Your Bags for the drink and Velum for the glass, I cut 2 pieces and put the pink paper and half the straw inside between the 2 pieces of velum so they look like they are on the inside of the glass. 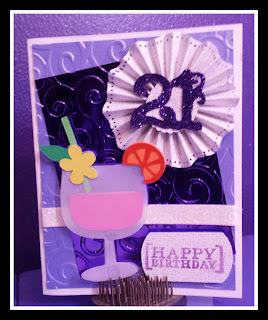 I used purple foil paper from Walmart and adhearded it to purple metallic paper and then put it through the Cuttlebug with the swirls folder. I show it all in the 1st video below. I made the rosette by just cutting 1.5" x 12" glitter paper and used an edge punch and then scored every 1/4" I cut the 21 from Cricut Alphabet and then cover in glitter. I show completely in the second video below. 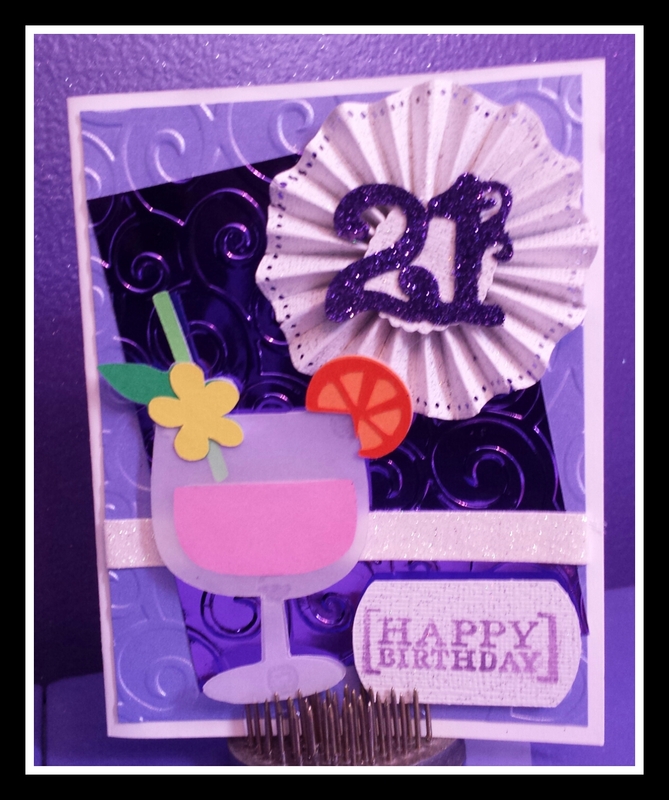 Check out the videos, the first one shows the embossing and drink. The second one continues the card showing the rosette, 21, and the stamping.